Don’t forget to sign up for the Society for Catholic Liturgy conference—just a few days left before registration closes on Sept. 22nd! And there will be plenty of opportunity to see old friends and make new ones at breakfasts, lunches, and dinners. All are welcome for three days of learning, prayer, and camaraderie. 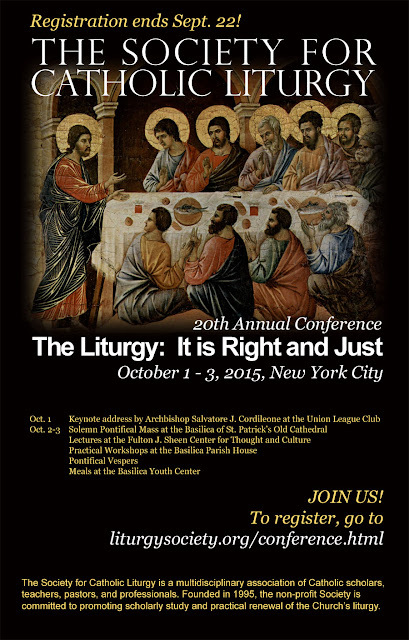 Founded in 1995, the Society for Catholic Liturgy is a unique organization that brings together faithful Catholic scholars and artists from around the world to recover, discuss, and promote the rich liturgical tradition of the Church. The Society holds an annual three-day conference, and publishes Antiphon: A Journal for Liturgical Renewal, which deals with important theoretical and practical questions in the fields of liturgy and sacramental theology.